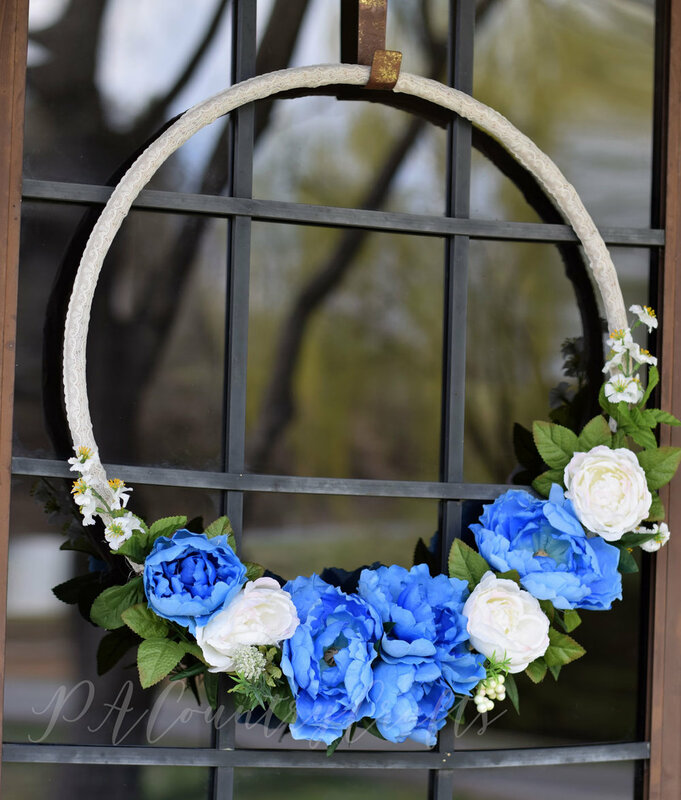 After I made the hula hoop wreath, I decided to add more blue accents in decorating on my front porch for spring. I had an old, rough cut board on hand so I decided to paint a sign. I loved how sharp my LOVE sign looked on the porch so I updated with a more generic message. I love how the blue and white really stand out! I like to group things in sets of three, so I stood it next to my milk can and an old galvanized bucket. We had this old nest in our shed that was found when we removed one of our bushes. I added a painted plastic egg just for fun. On the other side of the door, I stacked a few things on and around my old bushel basket. Years ago, when I used to sell crafts, my mom and I made some wooden bunnies. This one had lost its nose and it needed some updating. I showed the process in my Instagram stories. First, I let my 5yo give it a coat of pink paint, then I covered it in white. I wet the wood, then sanded it for a chippy, antique look. I also sanded the insides of the ears a little more to make them look like the pink insides of rabbit ears. Then, I tied the original pink gingham bow back on. It was a little too short so I stuck a rock in the bottom of the bucket to lift it higher. I put some forsythia clippings in an old jug. It is too cold here for most spring flowers, so it is the best that I can do. I stole this bird nest from my other porch. I don’t want them nesting there again this year because they are making a mess! Last night one of the birds flew into the house as we were walking inside. It kept flying circles around my kitchen and dining room. My husband was jumping and waving his hat around trying to swoosh it out the door. My daughters were blocking the doorway to the living rook with one of them standing on a chair in her underwear while holding a pillow. I was mostly just laughing at the ridiculousness of the entire situation. It took a solid 5 minutes to chase it back outside! The nest is already partially rebuilt, so I need to figure out another way to deter them. Any ideas? Overall, the porch turned out OK. I mean, I only spent $3 to make the wreath and the rest was done with things I found around the farm. I struggle to find the balance between too much and not enough. I feel like this is more towards “not enough” this time. What do you think it needs? Or should I just buckle down and repaint the doors?